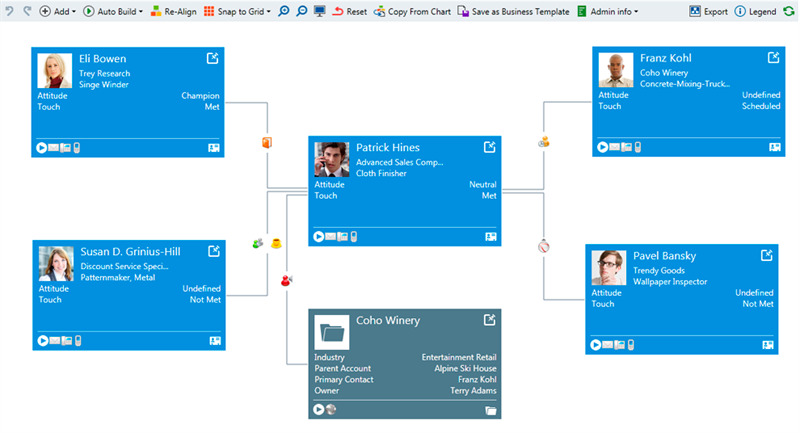 Relationship Charts is MS CRM visualization platform developed by WaveAccess for SalesCentric. Gartner Inc. nominated SalesCentric in their ‘Top 5 Cool Vendors 2008’ for Relationship Charts. Since the very first year, Relationship Charts was branded under different names: SalesCentric, c360 and now C4CRM, a talented MS CRM and SharePoint consulting and development team focused on delivering solutions for Dynamics CRM platform. The only thing that has not been changed is the team of developers. WaveAccess's team has more than 12-years of CRM experience and has provided, not only the stabalization of Relationship Charts for all these years, but also the ongoing extension of functionality. WaveAccess has been developing Relationship Charts for over 7 years and during this time the functionality of the product has been significantly improved. What benefits will Relationship Charts provide CRM users? Create activities directly from the chart.